Atmospheric CO2: Humans put 40 billion tons into the air annually. Did I Say 30 Billion Tons of CO2 a Year? I Meant 40. Every now and again a global warming denier will say that humans aren’t putting much carbon dioxide into the air, and it’s less than a lot of natural sources. I’ve pointed out that in fact, humans throw about 30 billion tons of it into the atmosphere every year, 100 times as much as volcanoes do. I got that number from a paper published a few years back. Well, I just found out that paper is out of date. Guesss what the more accurate, current number for the human-made CO2 pollution put into the air every year is? Yeah. 40. As in billions of tons. 40. That number comes from an assessment made by Le Quéré et al. in a paper measuring the total carbon budget for the planet in 2013. I found out about this new, updated number when I wrote about the launch of NASA’s Orbiting Carbon Observatory, or OCO. I mentioned the older number in the post, and got an email from David Crisp, OCO’s science team leader (!) correcting me. It’s almost impossible to grasp what 40 billion tons means. A cubic kilometer of water weighs a billion tons, but it’s hard to imagine a cube 3.5 kilometers (2.2 miles) on a side—the equivalent amount of water weighing 40 billion tons. The largest class of aircraft carrier weighs about 100,000 tons, but picturing 400,000 of them still strains the imagination (not to mention vaporizing them into the air every year). Funny, though, it’s small compared with the total mass of the Earth’s atmosphere, which is a staggering 5 x 1015—5 quadrillion— tons! By mass, this extra CO2 is only about 0.0008 percent of the Earth’s total air. But it adds up. By volume, CO2 is about 400 parts per million (ppm) of the atmosphere, or about 0.04 percent. How much are we adding? Looking at the Keeling Curve, which measures the concentration of CO2 in the air, we’ve added about 20 ppm in the 10 years from 2000 to 2010—that’s 2 ppm per year. 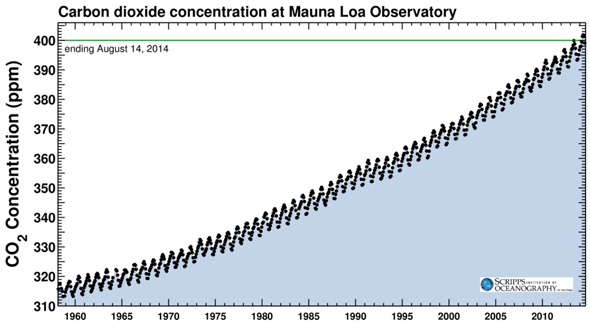 The Keeling Curve, measuring atmospheric carbon dioxide. The trend is pretty obvious. So, that 40 billion tons of extra carbon dioxide we dump into the air every year is accumulating at a rate of 2 parts per million when you look at the entire atmosphere. That sounds pretty small. But is it? I wish. For some things, it doesn’t take a lot to make a huge difference. As doctors will tell you, dose makes the poison. Four hundred ppm sounds like a small amount, but this concentration of carbon dioxide in our atmosphere is enough to raise the average temperature of the Earth significantly … and we’re putting more of it into the air every year. Forty billion tons worth. 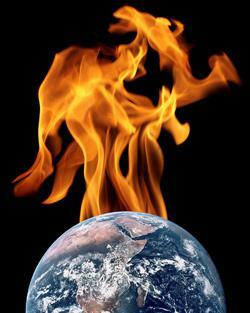 That’s why the planet is heating up. That’s why the climate is changing. That’s most likely why we’re seeing more extreme weather, hurricanes getting stronger, droughts drier, forest fires more intense. This is our fault, and it’s also most definitely our problem. There is hope … but we need to get our heads out of the sand together and take action. Now.